Visit our Prophecy Bookstore where you can subscribe to one full year of monthly PDFs for only $35 and receive a Free CD series or DVD of your choice. For more news, and for Jimmy DeYoung's Prophetic Prospective on the news, order Jimmy DeYoung's Until Newsletter - Electronic Edition. Available in the Prophecy Today Bookstore's Newsletter Section. 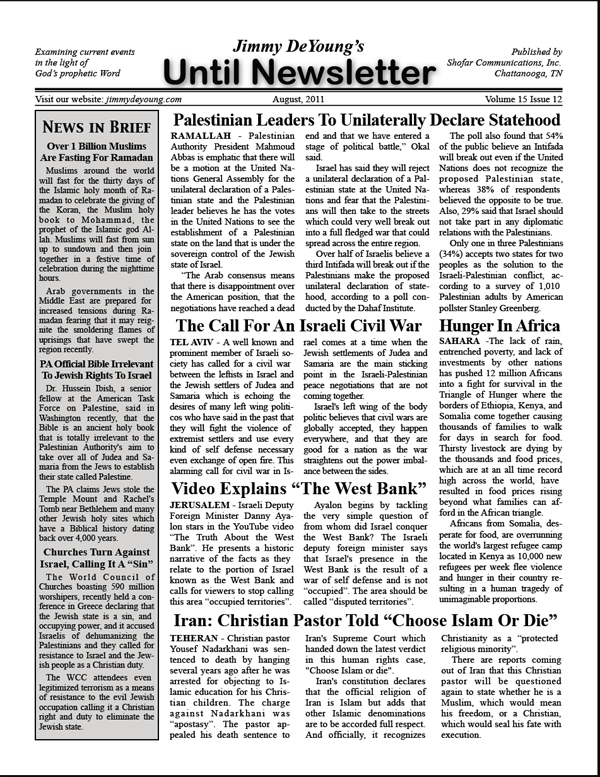 Jimmy DeYoung's Until Newsletter goes in-depth on the month's headlines and explains how these political, scientific, economic, and diplomatic events are setting the stage for the End Times scenario set forth in God's prophetic Word. Jimmy DeYoung's Until Newsletter is now available as a monthly download. Stay informed on the latest happenings around the world and how they relate to Bible prophecy. By subscribing to our electronic edition, you get your updates on the major news events of the month before anyone else.